My name is Sue Williams and I am a self-taught oil and pastel artist. After my retirement as an elementary educator, I now have the time to devote to painting. I love using oil, soft pastel and copic markers, brush and palette knife. 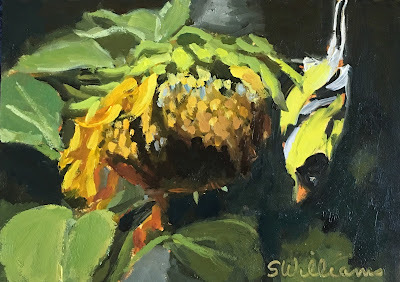 I am experimenting with subjects, paint mostly from photographs at this time, sketch figures, and strive to paint loosely. It's my goal to paint and sketch every day and continue my growth as an artist. Thanks for viewing my work. If 2018 was a person, I’d tell them this. Fall's Full of Color and Creativity! Retired from Classroom, Wanting to Move work...This on Auction! Thanks to the collector from California that ordered a print of First Lights of the Evening in the Short North!